This increase applied to suites, while the standalone Exchange Online plans shared mailboxes remain at 10GB max (but here’s a little secret, you can actually store more than 10GB in there, it just can’t send or receive emails when it gets above the 10GB limit, but you can happily store more than 10GB of email in there if you really wanted to. This has always made it a great archiving solution, given that it is free and all). 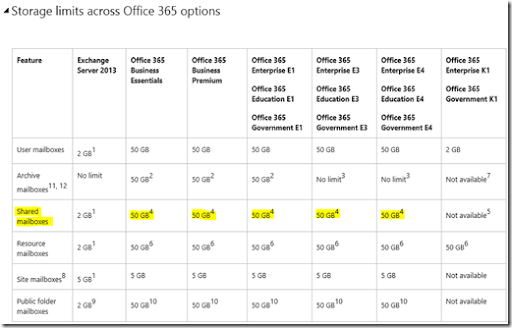 Office 365 Exchange Online shared mailboxes (which are free and unlimited) have been boosted to a maximum size of 50GB like any normal mailbox. Shared mailboxes cannot be logged into directly, they can only be access from users with a license for Exchange Online. So if you need to archive an old user’s mailbox, just convert it to a free Shared Mailbox (using PowerShell of course). Gotta love Office 365 don’t ya? Previous Post Does this mean Microsoft will buy Dropbox?